I was sent this ad by a fellow Korean adoptee from the Netherlands, and found it quite disturbing. 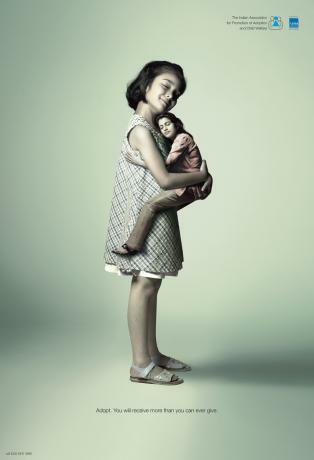 It’s part of a series of ads by the Indian Association for Promotion of Adoption and Child Welfare (for more about this campaign, click here). Perhaps the most viscerally disturbing part of this series is the way it completely uses a child to fulfill the needs of adults. To me, it re-emphasizes the idea that children are vehicles for adult self-esteem and identity and is completely opposite of my own personal stance on adoption which is about the child first and foremost. This ad campaign won several prestigious awards, and to the casual observer perhaps it doesn’t seem like much to fuss about. However, there are too many of us adoptees who have lived with the reality of being this child, emotionally catering to the selfish needs of adoptive parents who adopted us because they wanted someone to love them unconditionally. Sorry, but it’s the other way around; parents love their children unconditionally. Children, as any parent knows, totally love their parents on a conditional basis. Anyone who has parented a toddler or a teenager will know this first hand. I’m all for promoting same-country adoption, which this ad appears to be aimed towards. However, it doesn’t mitigate the disturbing nature of the way adoption is portrayed. The fictional or archetype child featured in these ad campaigns have already experienced the insufficiency of their love to hold on to their first parents; why would it make any sense that their love would be sufficient enough to hold on to another family? And furthermore, why is it the child’s responsibility to do so? Is this ad campaign for use in the US and other nations, or just in India? It gives me a nauseous feeling in my gut. I’m a two-time IA parent, and I never would have imagined my children pandering to my emotional needs or gratifying my unfulfilled desires the way this ad depicts. Ick. Who are the people this ad is aimed at? Petrie, I am not sure if this was just for India or other countries. Given the appearance of the children and the parents, I would guess it’s for India. My guess it’s to encourage South Asian Indians to adopt. If anyone finds out for sure, I would be happy to share the information. From the Acknowledgments section, it looks like UNICEF (!) is funding a Three-year Adoption Promotional Campaign in Maharashtra, India. This seems to be about domestic adoption, which makes it more palatable, in the sense of the end possibly justifying the culturally-based means. These ads should be banned! They are SO disturbing, why can’t EVERYONE see that? Since when do children carry anyone, physically or emotionally? Geezus. Adoption: Providing children for parents in need. They should have shown the children crumbling from the weight of this task. I was one of these children and it’s a burden I wouldn’t wish on anyone. These images are so disturbing. The thought that any adult would think it is okay to burden a child with this level of responsibility is just mind boggling. Our children owe us nothing, and certainly shouldn’t be expected to fill our emotional needs. Aesthetically, I found these ads quite creepy to start with, but it’s when I put a finger on what they really reminded me of that I finally got it: they remind me of certain ads for the pets that you adopt from shelters. By the way Jae Ran, I have been sponsoring a little girl (who lives with her parents and younger sister) in a poverty-struck part of Asia for the past several years. I would like to know your opinion of these sponsorship schemes, because I’ve been amazed to hear of people who are dead-set against them, and think that they lend to a charity mindset. Many of these same people would have no objection to actually removing the kids from their parents, mind you. Holy crap. What an awful couple of images. The idea that children are supposed to fulfill something for the parent is a pernicious one, a mindset that has caused an unbelievable amount of pain over the years. It’s a kid not as a person, but as an ideal, a concept — The Baby That Will Fix My Life. Sorry, no, it doesn’t work like that. And The Baby will spend a buttload of money on therapy to try and recover from that mindset. I’ve seen these before (and I wish I could remember where) and they made absolutely no sense to me. I kept looking at it and trying to figure it out. It also gave me a sick kind of feeling – and you’ve articulated why. Growing up being a caretaker at times for a parent, these images are extremely disturbing. I think you are making a cultural judgement without all the facts. What the ad says is your gain is not unconditional love but satisfaction of good parenting and your love helping the child grow. Indians see things differently to west. My perspective: the ads may be disturbing, but they’re pragmatic. I don’t know India well but I imagine parents in India don’t have the same positive attitude toward adoption as Americans. I know in Japan the view is also negative from the parental side. Adopting a child is seen as too difficult, emotionally and culturally. The stereotype is sort of that even if you bring yourself to the point where you can love the child, the child will never really return that love. Before I judge that negative stereotype too harshly, I remember the current positive attitude towards adoption in the U.S. is really not that new. 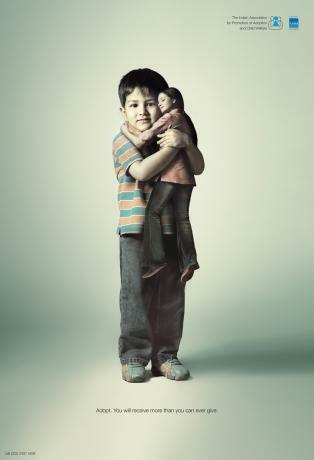 In that respect, the Indian ads attack negative feelings towards adoption and reassures the parents that yes, adoptive children can love back. It’s a good principle that “children should never provide for the needs of their parents” but this is not a strong principle embedded into many cultures. 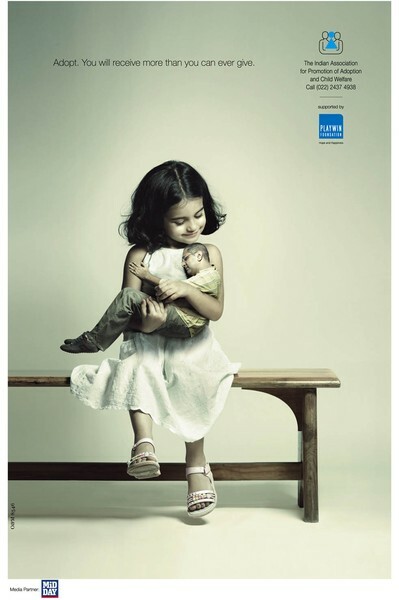 I doubt that ads encouraging domestic adoption “American style” would not be very effective in the Indian context. I also want to add, my own bias towards these pictures is that I really, really wish the Japanese government would do something like this campaign to encourage domestic fostering and adoption. I understand that there are different cultural expectations around the ideas and values of adoption in India, just as there are in Japan according to atlasien, and as I know there are in Korea too. Korea has long had a resistance to domestic adoption and this is something that many in S. Korea have been working to change for the last 20+ some years. Some may think that my critique of these ads is showing some kind of “pro-American” bias or a lack of cultural sensitivity or bias, but I disagree. Whether or not other cultures “value” the idea that children will provide for the emotional needs of their parents, I don’t like it. I don’t like the idea of culture-bound ideas in any culture being forced on children when it can hurt them. Just like I don’t like how some cultures value FGM for their girls and women. That is a value strongly held and I don’t believe that the cultural value outweighs the reality of what happens to the girls physically. I know that this (FGM) is an extreme example, but it’s just that I believe we are living in an age where “cultures” are not so fixed and beliefs are influenced by our greater access to each other. I wish that this Indian campaign had chosen another way to encourage domestic adoption rather than use the child to fulfill the emotional needs of the parents. I think this could have been an opportunity for those who value adoption to change the fears – whatever they are in Indian society – in ways that don’t exploit the emotional responsibilities of the child. I am far from being pro-American nor do I think that the attitudes and values in this country are always admirable or right. But I don’t think that culture trumps how one values a human being. Personally it creeps me out but I am not sure I can judge it the same way I would if it was being run in the US. I am no expert, nor even an amateur expert on Indian culture but Indian society is SUCH a different world, which shows in their media. In some ways you might compare it to American culture in the 1950’s, particularly regarding adoption. From what I have gleaned from my reading: adoption of relatives and known servants’ children has a long history, but the adoption of children from unknown parents, through agencies, is still gaining a foothold. And when it becomes a business even domestically, it is rife with ethical concerns. If you’ve ever watched Bollywood, you know that romanticism trumps realism. I am thinking this is a romanticized view of the desire many parents have to have children be there for them in their old age. I would be surprised if the psychoanalytic interpretation we are jumping to would have occurred to those who created this campaign. I’m certainly no expert on Indian culture either, but having been long-married into an Indian family, I’d venture to say that this particular cultural value (children providing for the needs – emotional and financial – of the parents) is a central psychosocial aspect, and not so easily modified as a traditional practice or a style of dress. This ad campaign is reaching straight into the core of that value. From what I’ve come to understand, the idea that this cultural value is hurtful to children is SO incredibly foreign to most Indian eyes and ears. In fact, the (Western) idea of childen NOT providing for the emotional and financial needs of the parents is typically seen as abusive and psychologically destructive to the family. There is a culturally embedded expectation of symbiosis which is very hard for me to put into words. The idea of NOT being responsible for my in-laws is as foreign and abhorrent to my India-born-and-largely-raised DH and my SIL as the idea of child abuse or murder is to me (and to them). Yes, to my sensibilities too, the value of human well-being comes first and foremost. But what I see as constituting and contributing to well-being has been developed in a particular cultural context. To me, that means we’re treading into the murky waters of moral relativism here. Bottom line: I’m hard-pressed to interpret this ad campaign, as others have said, in the same way I would in the West. Thanks, as always, for your thought-provoking posts. Those could be posters for the Parentified Child. Somebody was talking about culture bound ideas. Was listening to NPR recently and there was a feature story about the aging population and their ingrate, modern adult kids who don’t want to take care of them and how will pose a real problem for India (and Japan) in the future. I wonder if there was any discussion in the ad agency’s creative meetings about how a (grateful) adopted child would “owe” and thus “take better care” of their aparents? In Mexican culture, children are supposed to take care of their parents. There are many parentified Mexican kids. Certainly, that’s what I was forced to do…emotionally caretake my needy aparents. So these ads hit me over the head. Besides, they are just plain creepy!! !